My kids, including Delaney, like Adam Sandler movies. I’m sure they get it from me and their Happy GilMom, but one of their favorites is Bedtime Stories. There is a part in it where Sandler’s character thinks he is going to get a Ferrari. Not only he is going to get a Ferrari, he is going to get it for “freeeeeeeeee.” He never gets one, but at the end of this post, I’ll tell you how you can get one for freeeeeeeee! So with yesterday’s treatment, we are officially underway with Delaney’s Intensification Phase. I was talking to a friend yesterday afternoon and he asked if it was “chemo Friday” or if we were off that schedule. I told him yes it was “chemo Friday,” and Tuesday was going to be “more chemo Tuesday” and next Friday will be “even more chemo Friday.” So if yesterday’s kick-off, and how Delaney was feeling afterwards, was any indication, the Intensification Phase is going to live up to its name. So yes they added a new color of chemo, yes she has to take steroids and her dreaded troche again (as I am writing this she has seven pills in front of her that she needs to take), and yes her hair is going to start falling out again, but that’s not what I want to talk about here. Instead I want to share what Delaney (and my wife and I) will remember about yesterday. First, I need to back up a little over a month ago to Delaney’s kindergarten graduation. There was a part of the ceremony where the teacher had the students stand up when she said the profession that they wanted to be when they were older. I eagerly awaited her to call out “Mortgage Guy” so I could run up and high-five what surely would have been the dozens of kids that would have stood up, but she never did. 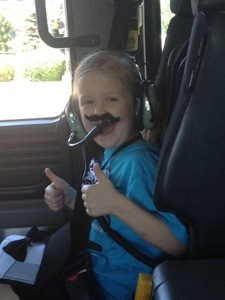 However, when she announced “Firefighter,” Delaney shot up out of her chair like her little “tuxedo” was on fire! Which brings us to Yesterday. Those of you that have been with us on this little (non) adventure from the beginning might remember one of Delaney’s best buds, Jacob R. Besides being an all-around great guy, Jacob’s dad happens to be a captain with the local fire department. When he offered that we could bring Delaney by the station sometime, we intentionally chose yesterday to help get her mind off her appointment and the fact that she couldn’t eat anything before it. When we arrived at the station, Mike (Jacob’s dad), met us and gave Delaney the VIP tour. She got to meet the other firefighters and paramedics (they were all very envious of the thick stache Delaney was sporting), see where they sleep and workout to get their big muscles, and even got to try on Mike’s firefighting jacket. I was grateful for all their medical training because I thought Delaney was going to pass out when Mike asked her if she wanted to go for a ride in the fire truck. We put on the cool firefighter headphones so we could hear each other and dispatch, and took the rig out for a quick spin. After making sure the coast was clear, Mike blared the horn and when we got back to the station he even put on the lights and sirens. You can tell from the pic below that Delaney might have just enjoyed herself a wee little bit. What you can’t see in the pic is her Mommy getting emotional as we just thought that this was SO nice of Mike and the fire department. For a little girl who wants to be a firefighter when she grows up, talk about a dream come true! That brings me back to the Ferrari…for freeeeeeeee. I probably should clarify that when I say Ferrari, I mean the Ferrari of support bracelets. We have some of her bracelets left over and while supplies last (I might have about 20 left), I’ll make you a deal. If you want one, would wear it, AND agree to pray for her for at least the next 60 days of her Intensification Phase, I’ll send you a bracelet for freeeeeee! My thought is that at some point in the day you’ll look down at your wrist and remember why you are wearing a bracelet with a silly/way cool mustache on it and then you can say a prayer for our little Delaney. Dealio??? If interested, just shoot me a quick email with your address to tomintraining@yahoo.com. Thank you in advance for your prayers and remember, that cute little girl you are praying for today, in the future might be the firefighter that rescues your little Fluffy from the tree. Like many things in our house, it all started with some excited giggling. It was Christmas morning and leukemia was still just one of many things that would get us to throw a few bucks in the jar to “help find a cure.” “Dad, open this one, open this one!” Delaney repeated. Inside the next four wrapped boxes, were clues tucked into athletic apparel. That first one, in a very Nostradamus way, said, “plan on spending a lot more time with your trainer!” I knew my trainer was Delaney, but there was no way my wife could have known how true that little prediction was going to become. So when Delaney was diagnosed with leukemia two months later, the Tough Mudder, like everything else in our lives, was no longer even close to a priority. As the months and treatment progressed and we settled into our “new normal,” we realized that the Tough Mudder actually fell at a “good” time in her treatment schedule. We weren’t really concerned about the race as much as letting Delaney have a fun vacation while she was still feeling well. Friday was her last chemo treatment for two weeks so this was as good a time as any to get away. So with the Tough Mudder being on like Donkey Kong, I let Delaney and her sister Ashley shave my hair into a Mohawk and we headed up to the mountains. My freshly bald head made the perfect canvas for my 12 year old to paint an orange leukemia ribbon on the back of my noggin. The event itself was a lot of fun and I even got to cross the finish line with Delaney on my shoulders. It would seem that was only a close second as her favorite part of the event… right behind seeing her dad get shocked. As for the weekend itself, we were able to get away from our house, but not able to escape the ever-present cancer. Both nights, our dinner was cut short right at about the time the food arrived because Delaney wasn’t feeling well. Sunday morning we could tell she just wasn’t her normal self, so we took her temperature (just another reality of cancer is we won’t be leaving the home for any length of time without the thermometer and her anti-nausea medicine). Sure enough, she had a 101.5 fever. In the non-cancer world, 101.5 is nothing to get too worked up about. However, the “cancer book” says anything over 100.5 requires a trip to the hospital because things could get bad real fast because of their inability to fight infection. This was confirmed when we called her doctor yesterday who said, “you’re lucky you got me, because anyone else would tell you to rush to the ER right now!” Considering that the traffic was moving along at 8 miles an hour, we weren’t about to rush anywhere! So we got to spend the morning today (and tomorrow) back at the doctor’s office where they gave her 30 minutes of antibiotic in her port. She has already been up to 100.9 degrees tonight so I am not 100% sure it is working. 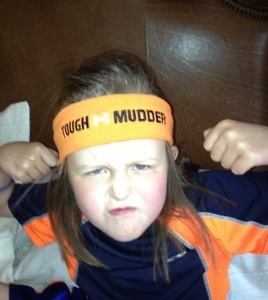 The challenge with our little Mudder is that she is SO tough. She’ll be sitting there just being silly and we’ll happen to take her temperature “just to be safe” only to discover she is already in the danger zone. Usually there is no whining, no crying, just a happy little Delaney that happens to not being feeling well. Which is one of the reasons that after I completed the Tough Mudder I posted a pic of the two of us on her http://www.facebook.com/CancerCanKissMyStache page. The caption read something along the lines of: One of us just ran up and down ski runs at 11,000 feet for eleven miles while getting shocked, climbing under barbed wire, swimming in 34 degree water, etc. The other one is the real stud. …she’s not drunk, I promise!!! Well, I think Delaney just had another successful spinal tap. She is out cold right now and they are injecting chemo in her port while she is recovering. While we are waiting for her to come to, I thought I’d give a quick update. She came in rocking her new custom Peach’s Neet Feet shoes (awesome organization!) and of course her ever-present mustache. She did her usual cracking everyone up and even told the nurses that they really didn’t have to sing this time because she brought her own music (that didn’t stop them from singing along with TAIO Cruz). We gave her a smooch, exited her room, and before we knew it were back in the room with her now. The Nurse Practitioner is reminding us that July and August is going to be really tough (and that we’ll need her to get an EKG before she can move to the next phase). It’s times like these that I am so grateful for my wonderful wife and all of you. The bartender throws all three out. Interrupting to say this is the Worst. Joke. EVER. Okay back to the joke that is now a riddle. The bartender throws all three out just as a police officer is walking by. The officer looks at all three, and arrests the midget for being under the influence. Q. None of them had a drop of alcohol at the bar. Why was the midget under the influence? Tomorrow Delaney kind of has a doozy of a day. Her labs were good today, which means her usual chemo dosage will be increased. If you’ll recall from her past two treatments, they would access her port, push the chemo in, and we would be bada binging our way right out of there! Tomorrow she still gets that kind of chemo in her port, along with some new medicine in her port, along with some in her spine. Which brings me back to the drunk midget. 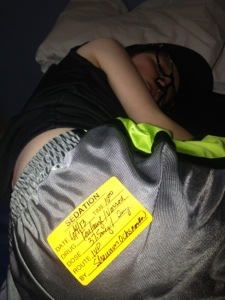 They actually give her a sticker that explains she has been sedated in case a police officer wants to know why are little mustached, bow tie wearing goofball is acting even funnier than she looks. Tonight I was listening to her giggle as she was bringing the water hose onto the trampoline, I wondered if she even had any idea about tomorrow. She obviously knew she had a treatment because she had to go get labs today, but did she have any idea that tomorrow’s appointment would be any different than her last treatment? I quickly got my answer when she asked, “Daddy, when they put me to sleep, do I sleep very long?” And then further confirmation when her sister Ashley asked about doing something with her tomorrow. She very matter of factly stated that she wouldn’t be feeling well tomorrow. Unfortunately, she is right. Apparently behind that mustache and bow tie, there is a very smart cookie. The good news though is that with each additional step and dose of chemo, she is like that crazy chicken, one step closer to the other side.